Maple. Peanut Butter. Pretzel. FUDGE. That’s exactly how I read this entry from one of my blogger idols, Heather, at Sprinkle Bakes. Oh, I’ve tried twice before to emulate her absolute perfection in the amazing treats of hers that I’ve tried to make. Unfortunately, I never seemed to execute the projects quite to her level of awesomeness. But I’m gonna be frank here — this time, I nailed it. The second I saw all those combined together in one delectable treat, I knew I had to make it for my friends this holiday season. The look of this fudge is so stunning. I love the way the pretzel rods and crumbs look on the top of the rich ganache layer. The middle layer is the thickest, creamiest, most scrumptious peanut butter fudge ever — with just a hint of maple. And the bottom is a “crust” of all chocolate/butter/crushed pretzel goodness. 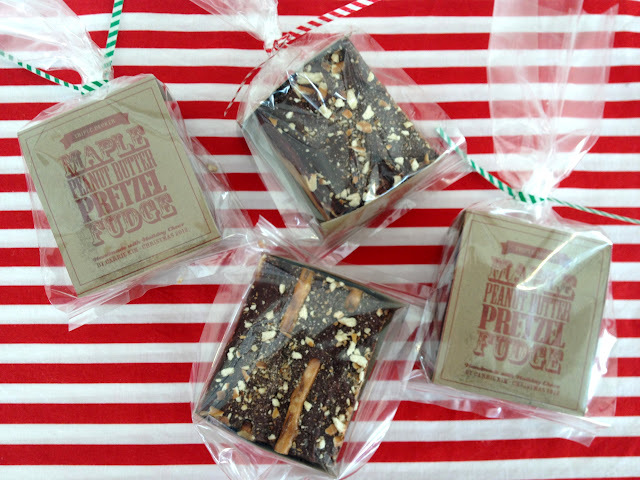 It was a no-brainer that I’d make the fudge, but what I didn’t know was how I was going to package it. Because it’s so pretty, I knew I wanted the wrapper to be clear, but just putting this stuff in a treat bag didn’t seem to do it justice. After trying a few things, I finally settled on printing a label to use as a backing inside, and printed it out on kraft brown cardstock. It’s super easy to do. Just leave an equal extra amount at the top and bottom of the label to score and fold over (I used a ruler on the fold line and traced over it with a butter knife —careful, you don’t want to cut through! 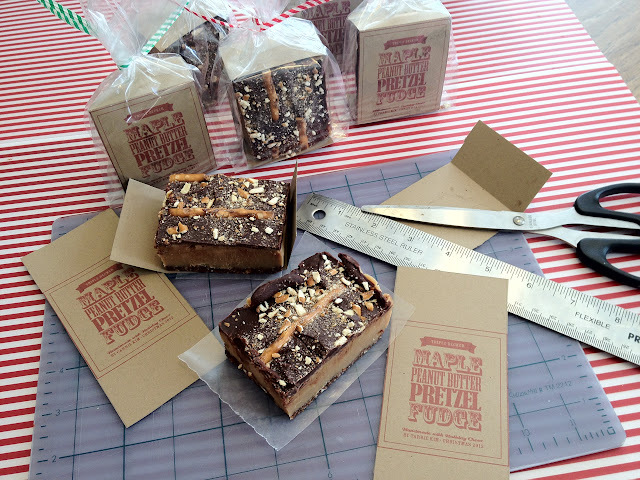 — to get a clean folded edge), so that the label wraps the bottom and top sides of the piece of fudge. I also recommend cutting a piece of wax paper for the fudge to sit on so that it doesn’t seep through the paper and mess up your pretty label! 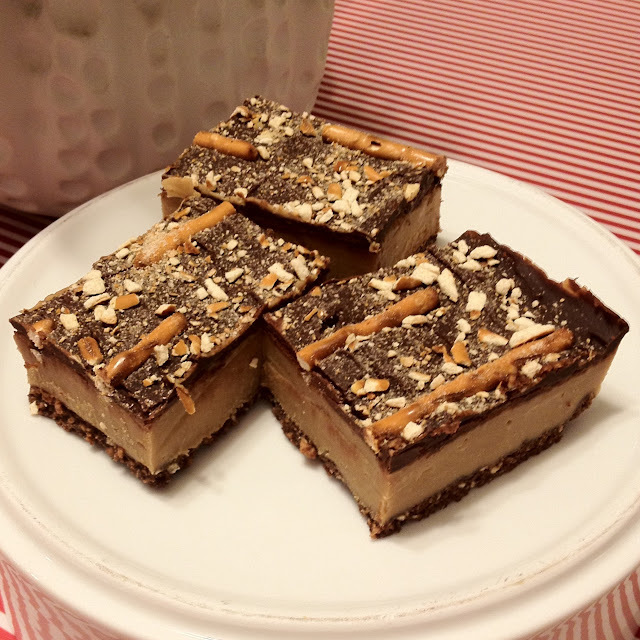 Want to make this delicious and amazing fudge? Of course you do! You can find the recipe here at Sprinkle Bakes (Heather, thank you for sharing this with the world!). If you’d like to use the tags I made, you can download the free printable tag here. If folding it as a backing isn’t your thing, punch a small hole and tie it to the outside with some red/white bakers twine to keep it looking seasonal! *added note: The pieces of fudge pictured are pretty huge. 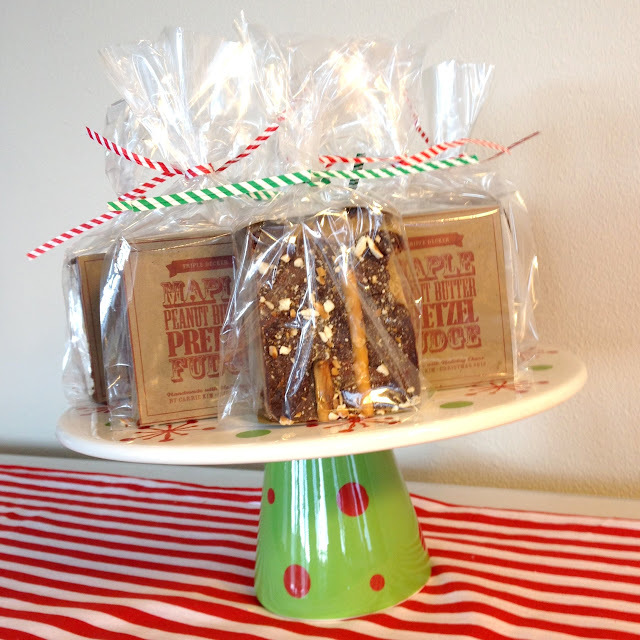 The idea was to give out mini “bricks” of fudge to each recipient. Again, because of how pretty the topping is, I thought it looked better to give a larger piece. You could realistically cut about four pieces of candy from the size of the block I have pictured. This entry was posted in Sweet Treats and tagged candy, custom tags, free downloads, holidays, how-to, packaging by Carrie Kim. Bookmark the permalink.